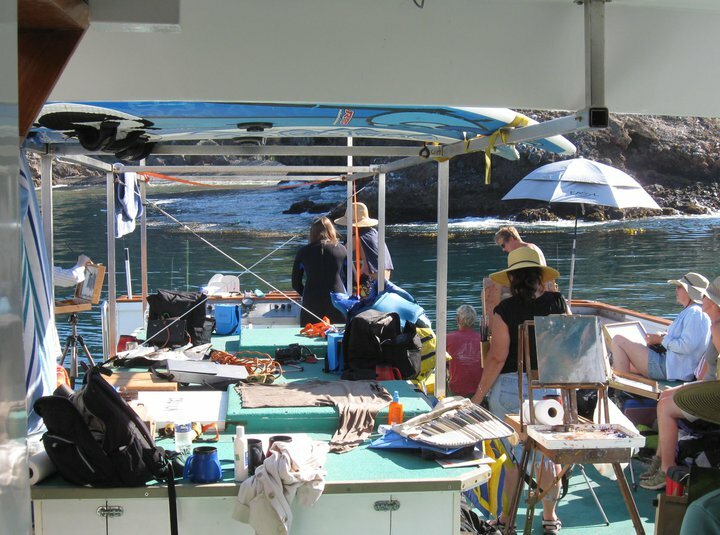 The photo above gives an impression of the boat deck that was host to 20 artists and a crew. Our boat The Conception is actually outfitted for 20 or more scuba divers, so having a bunch of artists on board was quite a shift for captain and crew. They helped us with some minor easel repair, getting kayaks prepared to launch, and when we could go to shore, they shuttled us back and forth on the zodiac. Mostly we painted on the deck of the boat. 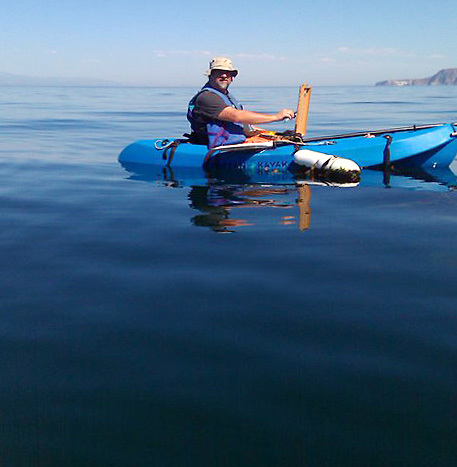 One time in Pelican Bay, I launched a kayak with my easel on my lap to do the painting “Kayak View”. 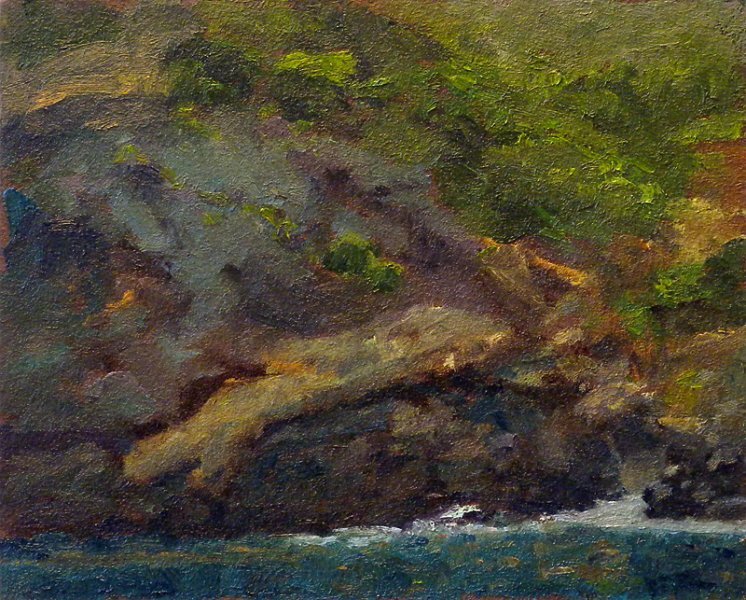 It was a bit of a challenge to do paint from the kayak, but I was up for it. With no umbrella, the painting is pretty dark. This happens with direct sunlight because your eyes see it lit with such bright light. This is why it is a good idea to paint under an umbrella, or some sort of shade, allowing the natural light of the sun to be diffused. I am thinking of doing a studio piece from this one… but brightening it up a bit. That evening after the sun was down, we could see the glow of the moon beginning to shift the color of the horizon. I quickly got out my paint box and a new panel to finally capture a moon rise. 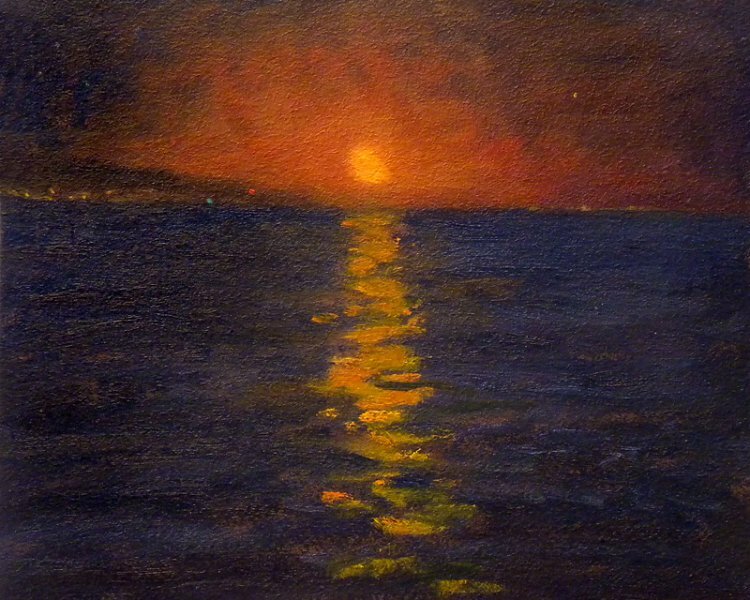 As my eyes adjusted to the darkness as I was looking across the calm water, I could see the lights of Santa Barbara and Carpenteria beginning to show. The sky was turning a dull orange/red and I could finally tell where the moon was going to pop up at. To my surprise, the moon was amber and gently lit the sky. Here is the painting. So where’s the photo of YOU on the kayak painting????? I know you have one… It is amazing!!! That would add to this already wonderful Kayak View!!! Nicely done, Rich! Love the texture you are consistently getting!